As investors look to overseas markets to diversify their investment portfolios, China continues to be underrepresented, but one may look to China A-shares exchange traded funds to gain exposure to mainland Chinese stocks. On the recent webcast (available On Demand for CE Credit), China: Your Top Questions Answered by Industry Experts, Robert Bush, Director and ETF Strategist at DWS revealed the results of a recent survey of investor portfolio construction habits specific to emerging markets and China, and he found that the majority of investors allocate 10% or less of their overall portfolio to the developing markets. Furthermore, within their small position in the emerging markets, Chinese equities typically make up a fraction of the emerging market position. To help investors gain a better perspective on the size of the Chinese markets, Bush pointed to the upcoming full inclusion of Chinese A-shares, or Chinese mainland stocks, to the benchmark MSCI Emerging Market Index. Starting June 1, 226 China A-Large-Cap shares were officially included in the benchmark MSCI Emerging Markets, MSCI ACWI, and MSCI China benchmark indices. The China A-shares initially made up 0.39% of the MSCI Emerging Markets Index, but the share class will make up about 16% of the benchmark upon full inclusion, along with another 28% in other Chinese company stocks in other share classes. "It is expected that over time, the A-Shares will be 'fully included' within the MSCI Index universe. This will increase the A-Share’s FIF-adjusted market capitalization to 100%. Projecting off of the weighting from the initial inclusion on June 1, fully included A-Shares and China would respectively comprise approximately 15% and 47% of the MSCI EM Index," Luke Oliver, Head of U.S. ETF Capital Markets at DWS, said. DWS has found that many investors favor China exposure due to the emerging market's businesses and population growth, followed by diversification benefits and improving technologies. However, there are some drawbacks as investors have pointed to risks stemming from the government, volatility, transparency, accounting practices and currency fluctuations. Looking ahead, Bush highlighted China's ongoing shift toward domestic consumption and less dependence on investments to fuel further GDP growth. While investment is coming down, the quality of investments are increasing, with more investment in technology as China is facing wage problem and has relocated nearly all textile industry to Southeast Asia. Furthermore, a steady growing middle class will support the growth in the coming years ahead. As investors look to a global investment portfolio, China is becoming too big to ignore. China is the world’s second largest economy, expanding at a rate three times faster than the United States. China’s economy has also grown to nine times its size in 2000. China's share of global GDP made up 15.0% in 2017, compared the U.S.'s 24.3%. Despite the slowdown in growth as the economy matures, China's GDP is expected to continue to expand at a rate of over 6.0% through 2021. Warren Buffett famously asserted that the ratio of stock market capitalization to GDP “is probably the best single measure of where valuations stand at any given moment." 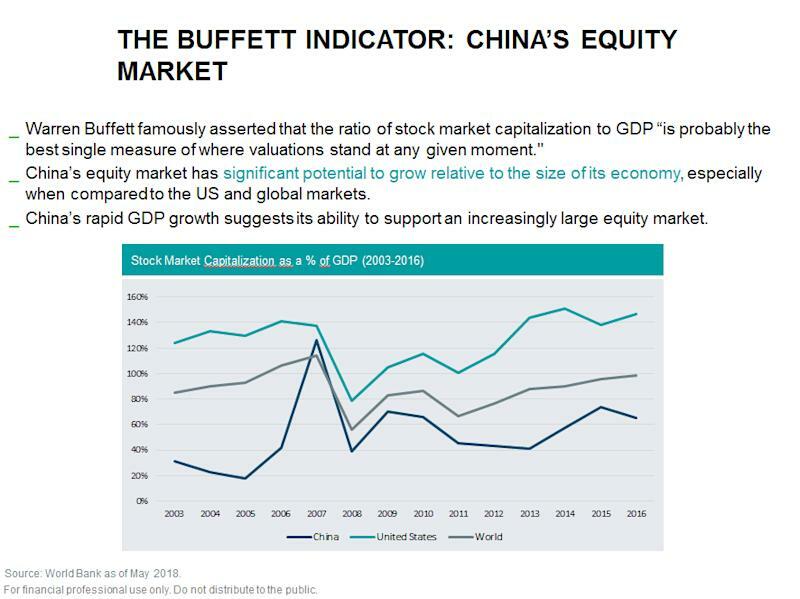 China’s equity market still has significant potential to grow relative to the size of its economy. "China’s rapid GDP growth suggests its ability to support an increasingly large equity market," Bush said. China A-shares are comprised of stocks of companies incorporated in China and traded on the Shanghai and Shenzhen stock exchanges. A-Shares are the largest Chinese share class. Investors are Chinese nationals and foreign institutional investors authorized under the Qualified Foreign Institutional Investors (QFII) program. Most investors may be acquainted with Chinese H-shares or N-shares. H-shares are stocks of companies incorporated in China and traded on the Hong Kong stock exchange. N-Shares are stocks of companies incorporated in China but listed and traded on the New York Stock Exchange. The majority of China country-specific ETFs available cover indices based off these Hong Kong- or NYSE-listed Chinese company stocks. Potential investors who are interested in taking a direct look into China’s market have a number of options available. Sean Edkins, Director and Head of ETF Sales and Strategic Partnerships for DWS Asset Management, outlined several options at DWS, including the Xtrackers MSCI All China Equity ETF (CN) , Xtrackers CSI 300 China A-Shares ETF (ASHR) , Xtrackers CSI 500 China A-Shares Small Cap ETF (NYSEArca: ASHS) and Xtrackers MSCI China A Inclusion Equity ETF (ASHX) . ASHS tracks more mid-sized Chinese A-shares, including Chinese A-shares taken from the China Securities 500 Index, stocks listed in Shanghai and Shenzhen. CN has a broader portfolio, allowing investors to track mainland Chinese stocks, with a 30.6% position in ASHX and 4.8% in ASHS, and the fund holds Chinese stocks listed in the U.S. and Hong Kong. Lastly, ASHX, which recently switched its underlying index to the MSCI China A Inclusion Index, tracks the progressive partial inclusion of A shares in the MSCI Emerging Markets Index over time. Financial advisors who are interested in learning more about China market opportunities can watch the webcast here on demand.